It has been some time since I’ve had the funds or the time really to do much of anything in the modelling realm. I’ve simply not had the funds to bring a lot of the work I’ve had underway forward to completion. Thanks to the Taxman and a payout due to being laid off, I’ve been able to order some extra parts to complete most of my Railbox cars. The most important of all the parts has been a set of Microscale decals. I ordered these from Microscale in the US and very quickly in the post I received 3 packets of Microscale (87-1291) HO scale RBOX & ABOX decals. Microscale’s service was fast and excellent after ordering directly from their website. They decal two cars of each type and come with all the car data you need for the cars. I have a lot of these cars to re-work; at last count I believe about there were 10 in total. I have enough to cover 6 cars for now. With my layout that I’m building (currently set in 1978) there’s latitude for the Hunter Valley to have bought some similar per diem boxcars. These cars I’ll complete last as I have to produce or manufacture my own decals for them. The Athearn model is, except for the roof pattern used, correct for the XAF10 series cars. The kit does not have the detail that modern-day kits come with as standard, but they were only $7.50 when I bought them and even after the upgrade process will top out in real dollar terms at less than I can buy the newer models for now. To keep the costs down I’m making most of the add-on parts. To be fair I love scratch building. It has always been my favourite part of the hobby. Let me say this before the rivet counters jump in: I know that the roof panels on these cars are wrong, I can live with that. At the height above the floor the new layout will be, they really won’t be all that obvious,even if they may be easy to see. Trucks – I replace these on all of my Blue-Box cars. In this case they’ll be the 70 ton roller bearing trucks (fully equalised) by Kadee. I love these trucks, and with proper weighting they run like a dream floating along and bending to the poor track of the HVL (we are a ribbon in the weeds kind of Shortline you know). At around A$15.00 per pair they are not cheap, but they work so well I’ll eventually fit them on my entire fleet as I can afford to. Remember how I said no plan survives first contact? If I were a purist, or a glutton for punishment, I could rework the car ends. There is much that could be done by milling the ends and cleaning everything up and starting again. I just can’t be bothered. The ends are good enough, and because they’ll be in between other cars, and generally not focused on I’m not going to worry. The coupler box used on the model is wider that the real one used on the real car, but again, this is between the cars during normal operation and really, I just don’t think it matters. I’ll live with it. In part 2 I’ll provide a historical context to the build, and then in part 3 I’ll move on to reworking the basic car into something better for your railroad, and mine. 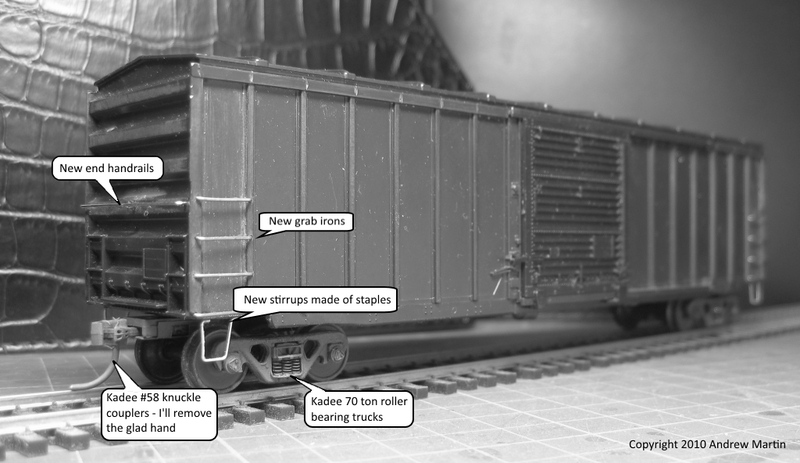 This entry was posted in Boxcars, Per Diem and tagged Athearn, Blue box, Boxcar, cheap, railbox, scratchbuilding, Updates. Bookmark the permalink. Reblogged this on The M.o.B..